The New Year is slowly nearing and with the holiday season upon us, many people are indulging in retrospection and reevaluating some of their life choices. New Year's resolutions are the perfect opportunity for those looking to make changes that they said they would make next week, or month or when winter ends. Well, now is your chance. We're putting together 25+ blog post for the most common New Year's resolution with tips and links to helpful articles that will hopefully inspire you to make a few changes (if you're anything like us, you'll need a few options). When it comes to New Year's resolutions, losing weight is at the top of the list, combined with "exercise more" and "stay fit + healthy". It's something that over a third of the population wishes to achieve, but it's a really, really difficult one. And, there's a chance they're facing this challenge backwards. So, what does work? Besides dedication and motivation, a great plan! When setting goals, make sure they're realistic -- go the gym 3 times a week, stop drinking soft drinks or lose 5 pounds by February. Setting drastic resolutions, like losing 20lbs in a month, is unrealistic. Goals like these can leave you feeling discourage and give up after not reaching them. People often set goals, but don't have a good idea on how to get there. Without a detailed plan, you're likely to go back to previous eating and exercise patterns. 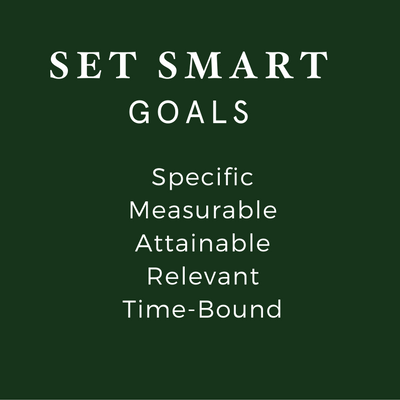 Set a goal that's specific, measurable and trackable. Walk for 20 minutes three times a week or eat more veggies (this is always an easy option) Focus on changes that you can make a part of your lifestyle seamlessly so you'll be able to sustain them for the long haul. When someone says diet their thinking deprivation. If your weight loss plan feels like a drag, you're going to feel punished and abandon it. Instead, find a "food pattern" ( a phrase we borrowed from our RD) that works for you long term. Check out this link to a great read about the "Psychology of Dieting" by our very own Sarah Waybright. Make some basic alterations to your lifestyle. These changes don't all have to happen at once, but changes in what you eat, when you eat it, and how much you move your body will ultimately cause you to lose weight. People who aren't willing to change their lifestyle will have a harder time with weight loss. So, if your plan is to lose weight for the New Year, make sure to set realistic goals, have a plan and think long term. Let us know about your New Year's resolution below. Make sure to stick around for more New Year's resolution ideas.